One of my favorite ways to take advantage of all the fresh produce around this time of year is to throw a pizza party. 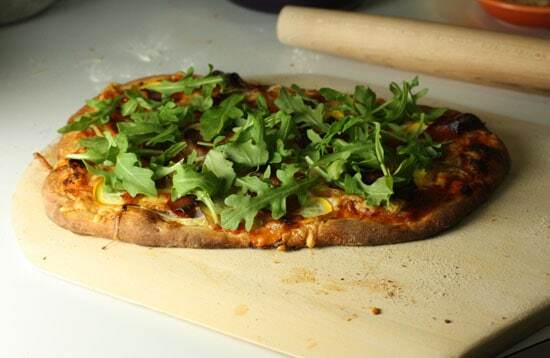 Invite a few friends over, take a trip to the farmer’s market and pick out some really fresh toppings, and then experiment with four or five different pizzas! The thing about having a pizza party like this is that a lot of the work is front-loaded (making the dough, cutting toppings, grating cheese, etc) so when the party is in full-swing, you can actually relax with everybody else! 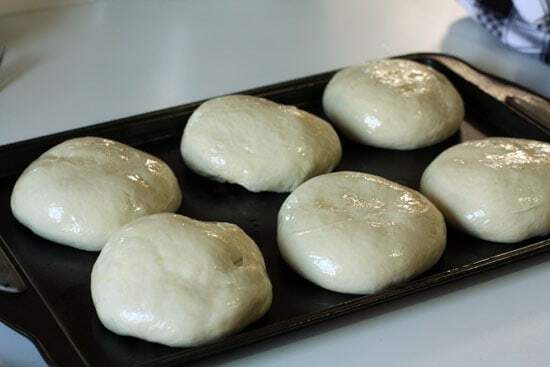 Makes 4 10-ounce dough balls. 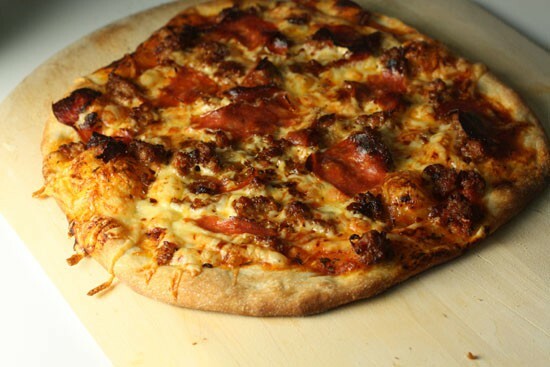 This is my go-to pizza dough recipe these days. I find that it makes a really nice crust that isn’t too thick or thin. It’s has a great crunch to it but is still a tiny bit chewy in the middle. It’s pretty all-purpose which I like for a thing like this where I’m making a bunch of different pizzas. If you’re using a mixer, mix all the dry ingredients together in the mixing bowl and then add the wet ingredients. Mix on low speed with a dough hook until everything comes together (about 4 minutes), then let the dough rest for 5 minutes in the bowl. This will help it relax and make it easier to mix. Then mix it on medium-low for another 2 minutes until it forms a smooth ball that clears the sides of the bowl but sticks slightly to the bottom. If you’re using hands, stir everything together in a bowl until it forms a ball. Mix the dough with your hands by continuously dipping your hand in water and work the dough as you turn the ball (think of your hand like a dough hook). As all the flour gets incorporated, the dough will become hard to work with. Let it rest for 5 minutes at that point to relax (you and the dough). Then continue mixing again for 2 or 3 minutes until it passes the windowpane test. 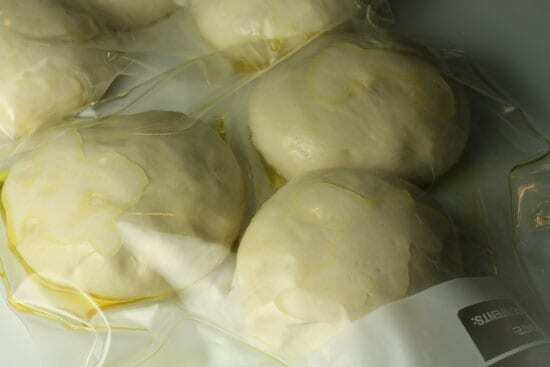 Regardless of what technique you use, measure your dough out into 10 ounce balls right away and put them in large plastic bags with some olive oil. Let these sit at room temperature for 15 minutes and then stick them in the fridge overnight. If you don’t have time for that, you can let them rise at room temperature for an hour, then take them out of the bags, punch them down to get out some of the gas, return them to the bags, and refrigerate them for 2 hours. I highly recommend just doing the dough the day before (or a few days before). 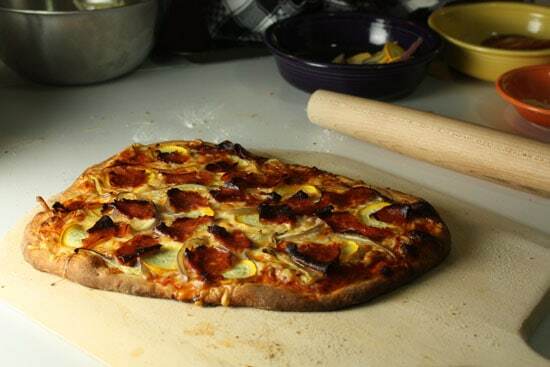 You’ll end up with better crust and less work to do the day of the pizza making. This was my dough after a night in the fridge. Results of the slow rise. Whether or not you decide to give your pizza the overnight treatment, you need to bring the pizza back to room temperature before using it. Otherwise it’ll be too hard to work with. At least two hours before you want to make pizza, take out each dough ball, punch it down, form a ball and put it on a baking sheet. So to be clear, if you want to make the dough the same day you’re making the pizza, you need to make it about 6 hours before dinner time. Trust me. It’s easier to do it the day before by a long shot. Finally, some pizza making. 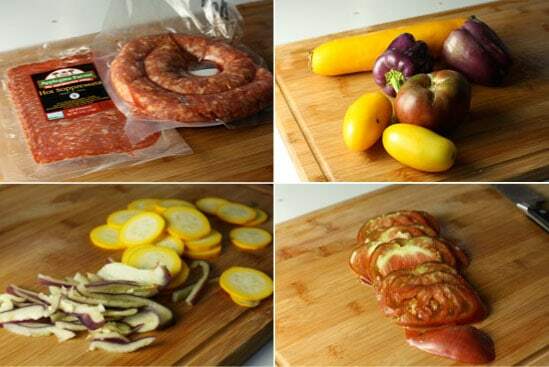 I picked up a few great things at the farmer’s market for this meal including some heirloom tomatoes, purple peppers, nice yellow squash, fresh arugula, and hot Italian sausage. I picked up some sopressata and a few other things (like a lot of mozzarella cheese) from the store as well. Can’t go wrong here really. Makes 6 Cups, enough for probably 18 pizzas. You can freeze the leftovers! Just mix all that together in a big bowl and you’re ready to go! It’s actually a really delicious sauce. I used the exact same technique to make each of the below pizzas. Roll out the dough until it’s the desired size (I shot for about 12 inches across). 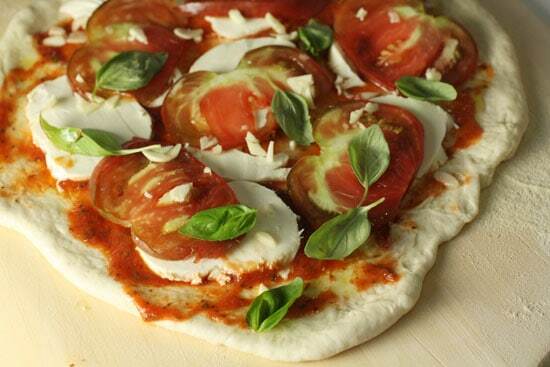 Place the dough on a pizza peel that’s been dusted with corn meal or semolina flour. Add a few Tablespoons of sauce. Add your toppings. Slide it onto a 500 degree (pre-heated) pizza stone. Each pizza should take 10-12 minutes to be done. 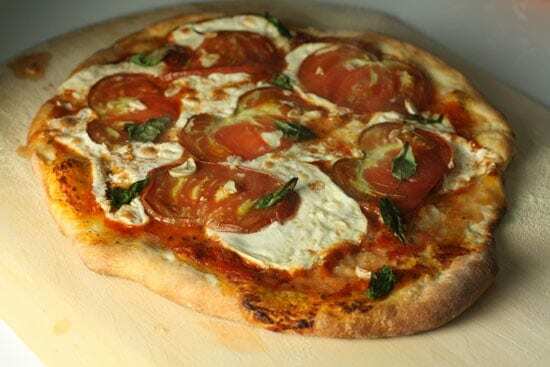 The first pizza I made was a take on a classic Italian pizza with fresh mozzarella, heirloom tomatoes, and basil. It’s also the pizza in the first photo for this post. I had some meat lovers in attendance so I did one with just the Italian sausage (I pre-cooked it) and the sopressata. This one had these nice little purple pepper slices on it along with fresh yellow squash, cheese, and sopressata. The purple peppers lost a bit of their color in the oven, but it was still tasty. I made a pizza at the end of the night with just the leftovers so it had some meat, some peppers and squash, a few tomatoes, and I topped it some fresh arugula when it came out of the oven which gave it a peppery flavor. I’ve posted a lot of pizza posts on Macheesmo, but hopefully they make it accessible. The thing that made all these pizzas very tasty was the nice fresh veggies. Their flavors really came through nicely. I was really impressed by how much I liked the squash actually. Pizza is really one of my favorite things to make and with just a bit of time you can blow 95% of restaurant pizzas out of the water. Pizzas look great! I also got some purple peppers at the market this weekend – so delicious and beautiful! I am a terribly inexperienced baker – I rarely even make stuff from a box, I just avoid it all together. I think I might give this a shot, though, because it looks delicious! 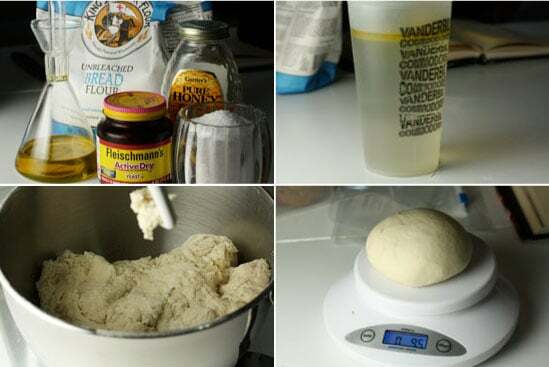 What is the difference between instant yeast and bread machine yeast and rapid rise yeast? Are they interchangeable? 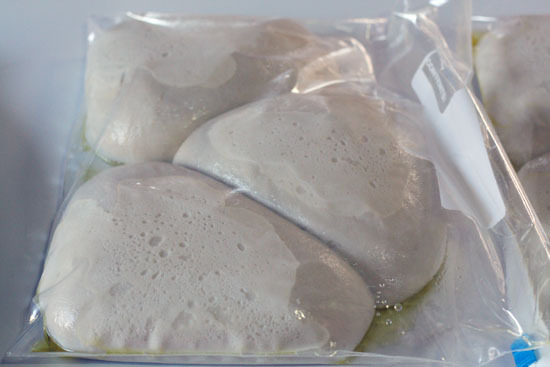 I know that I have a package of rapid rise yeast in the freezer and a container of bread machine yeast in the fridge. I am going to have to “brute force” this one :) Any tips for someone who has never kneaded a thing in her life? I really appreciate your tips like dipping hands in water and the window pane test! Awesome! I love converting people to homemade pizza! This recipe isn’t like a traditional kneading one where you throw it out on the board and knead it… Kneading it in the bowl with a wet hand is a lot easier in my opinion. now this is pizza. bravo. nice. i haven’t made pizza in awhile, it is time. Gotta get my peel from my parents house! Beautiful pizza! I recently bought another pizza stone after losing my last one in a move years ago. I forgot the amazing difference it makes! I haven’t quite got around to buying a peel yet, but it’s on the list! I am going to use this post with a few friends. I had already planned on having a pizza party for a group of very poor ladies who want to learn to make pizza, both for home use as well as for sale in the 'hood. Pizza is a pricey novelty item in the poor 'burbs of the capital. I make pizza all the time at home with the incredibly fresh produce of Central America. Thanks for a bit more encouragement to throw a pizza party. I also refrigerate my dough. Good reminder! Thanks!